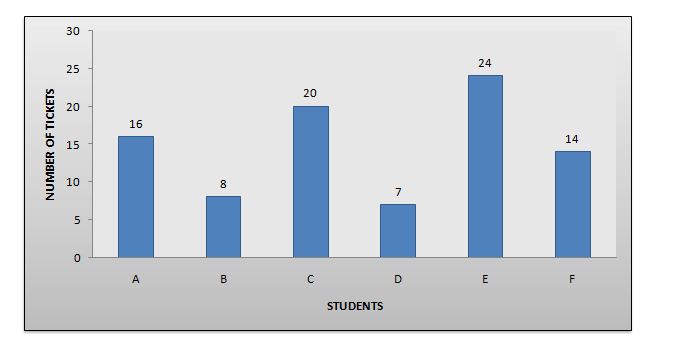 Directions: The bar graph, given here, shows the number of tickets sold by 6 students A, B. C, D, E and F during a fair. Observe the graph and answer questions based on it. Answer 2: (4) From the graph given in the question: Least number of tickets were sold by D. He sold 7 tickets. Answer 3: (3) From the graph given in the question: Ticket sold by D = 7 Ticket sold by E = 24 Ticket sold by F = 14 Thus, the required answer is = 7 + 24 + 14 = 45.
to level …DI and LR are worst..
Hi Vandana, we are adding slowly and steadily more content. You will see tougher sets in August and September.